Arsenic is a chemical element found in nature. It is a metal and is used in industry to strengthen alloys of copper and lead in car batteries as an example. It is also used extensively in semiconductors. 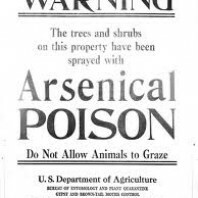 The bottom line here and what we are worried about is that arsenic is a notorious poison and has been used in pesticides, herbicides and insecticides for years. Arsenic in drinking water causes poisoning throughout the world. Levels of 10 parts per billion are the standard for the World Health Organization as the maximum allowed. Arsenic can cause cancer when levels reach 150 parts per billion. 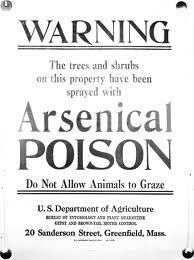 In the US arsenic has been used as a wood preservative for many, many years but has recently been taken off the market. The short story is that arsenic causes death from multi-organ failure, by necrotic cell death. Basically you bleed to death from every cell in your body. But that is just for ingesting a large dose all at once. For long term exposure there is a marked increase in bladder, kidney, lung, liver and colon cancer. For more in depth information go to Arsenic in Wikipedia. Treatment of chronic arsenic poisoning is easily accomplished. British anti-lewisite (dimercaprol) is prescribed in dosages of 5 mg/kg up to 300 mg each 4 hours for the first day. Then administer the same dosage each 6 hours for the second day. Then prescribe this dosage each 8 hours for eight additional days. However the Agency for Toxic Substances and Disease Registry (ATSDR) states that the long-term effects of arsenic exposure cannot be predicted. Blood, urine, hair, and nails may be tested for arsenic; however, these tests cannot foresee possible health outcomes from the exposure.Excretion occurs in the urine and long-term exposure to arsenic has been linked to bladder and kidney cancer in addition to cancer of the liver, prostate, skin, lungs and nasal cavity. Recently the “Dr. Oz” show did a report on a finding that 10% of apple juice and grape juice samples had total arsenic levels above the 10 parts per billion allowed in drinking water. The FDA says that the current avg level of arsenic in these juices is 23 parts per billion, over twice what is allowed in drinking water. As you may expect, US apple juice is generally made from concentrate, which over 60% in imported from China and China has a terrible track record on food safety. The US Food and Drug Administration prevented over 9000 unsafe products from entering the US between 2006 and 2010 but only 2% of imported food is inspected. Apple juice is considered a healthy staple of many children’s diets. This is a serious long term problem. There is a shocking amount of arsenic in chicken, because there is arsenic in the chicken feed. If you buy organic you will be getting food that has been produced under much stricter standards. It has recently been found that the level of arsenic in rice is also way above the federal water standard of 10 parts per billion. I have been eating much more rice on my plant-based diet. 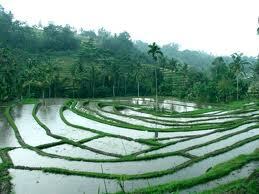 Rice is grown in fields that are flooded and arsenic is found in the ground and ground water world wide.